I’m not trying to start a fight. There’s no reason the two factions cannot get along. But when you reach a certain age, there is a question that begs to be asked. Which group of kids grew up to be the backbone of America – newspaper carriers or safety-patrol crossing guards? I am, of course, referring to a long-ago era when children exclusively filled those vital roles in society. It was a different time. I’ll admit to a certain bias. I wore a crossing guard’s orange sash and shiny badge when I was in the sixth grade. And I like to think our dedicated paramilitary corps saved a lot of lives. Though perhaps that’s partly a delusion. My only service as a newspaper carrier involved helping my friend Bob with his route on a few occasions and delivering a local weekly “shopper” a time or two. The latter experience introduced me to the concept of being yelled at by adults I didn’t know. But I’ll allow that those delivering daily newspapers acquired a skill set that stood them in good stead later in life. Perhaps the same could be said about crossing guards. So let’s consider the two job profiles. Which was the surer path to being a model citizen? Newspaper carriers: Had to maintain a rigorous discipline about completing their appointed rounds. Crossing guards: Had to exhibit a certain fearlessness about placing themselves in harm’s way. Newspaper carriers: Learned about money and reality when it came time to go around and collect payments from sometimes recalcitrant, occasionally underdressed or inebriated subscribers. Crossing guards: Needed to maintain focus on the job even if certain grade school sirens attempted to distract them from their solemn duties. 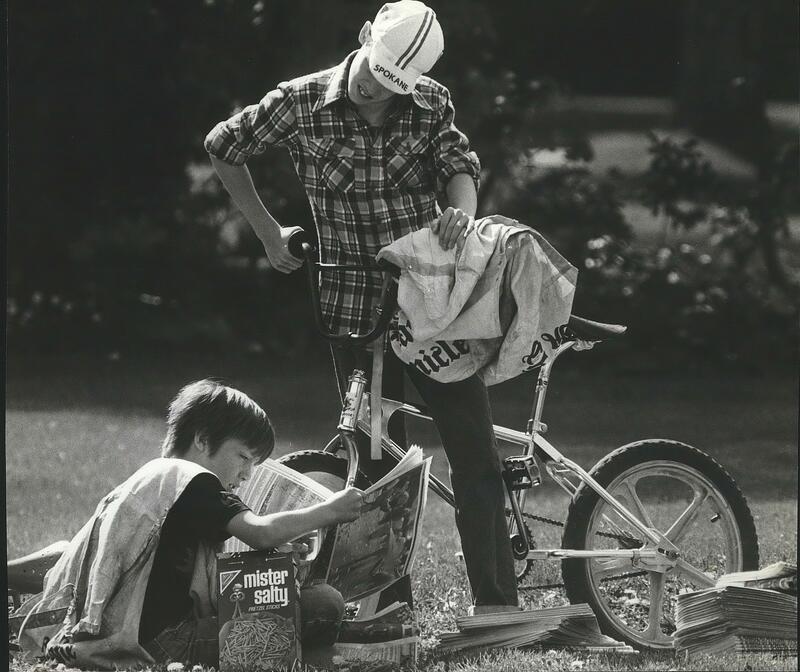 Newspaper carriers: Had to learn to reach back into their bag, extract a rolled-up or skillfully folded paper and then chuck it in the general direction of the porch – all from a moving bike. Crossing guards: Had to weigh the admittedly unlikely possibility that if things got really bad in Vietnam the powers that be might start calling up patrol boys. Newspaper carriers: Had to maintain nerves of steel when approaching that one yard where the snarling dog had previously issued carnivorous threats against the hapless delivery boy or girl. Crossing guards: Had to endure heckling from passing high school kids. Crossing guards: Rain or shine, duty called. Crossing guards: Had to resist the ever-present temptation to become drunk with power and issue imperial edicts well beyond the scope of a crossing guard’s purview. Newspaper carriers: If they delivered a morning paper, they had to get up mind-blowingly early and do their route while classmates were still in bed in their peepee jammies. If they delivered an evening paper, they had to be on the job while unemployed layabout friends whooped it up after school. Crossing guards: Had to get to their corners before classmates started staggering to school and/or stay after the dismissal bell to make sure some inattentive young pedestrian did not become a traffic casualty. And I suppose it is fair to say both childhood occupations produced men and women who became valuable, contributing members of society. So let’s forget about having to choose one over the other. There’s something to be said for either path.